As creatives we are not reinventing the wheel but taking the ingredients that we already know about and blending them into a new recipe. We are merging them in a new way - to make them creative. What I like about this quote is it gives the solution for finding your idea and overcoming your creative rut. Today I am in a rut trying to create this post that you are reading. So instead of trying to reinvent the wheel, I am talking about creative ruts and how to overcome them to inspire myself but hopefully you as well. 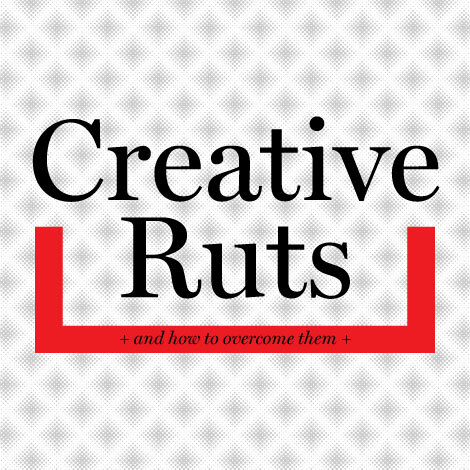 Idea expert Jack Foster explains creative ruts perfectly. "Of course you're in a rut. Admit it." "Why do you think you do the same things the same way in the same order every morning when you wake up? ... Or eat the way you eat, or dress the way you dress, or think the way you think, or, or, or?" "It's because you're in a rut." In his book How To Get Ideas he goes further to offer some advice. "And if you just stay in your rut and let things creep in naturally, you'll never pile up the kind of varied and extensive database you need to form new ideas." "There's a huge, fascinating, exploding world of information out there – in any direction you care to look." "But you must look. And the sooner you do the sooner you'll become aware of "old elements" you didn't even know existed." So that is what I will do I will take a break from here and get my brain focusing on something else. I will listen to music that I have not listened to before. I will visit a place I have not visited before. Maybe I will study a different language. I will get out of my creative rut. In my experience here is a summary of how I have been able to get from under my creative rut. The ideas will start pouring in! I hope this has been helpful. I am good now. I've always found blogging is a great way to work through and test ideas (and get out of those ruts). I think learning how to communicate goes hand in hand with learning how to be creative.